Enter a world of colour, culture, and cherished spiritual tradition of India. 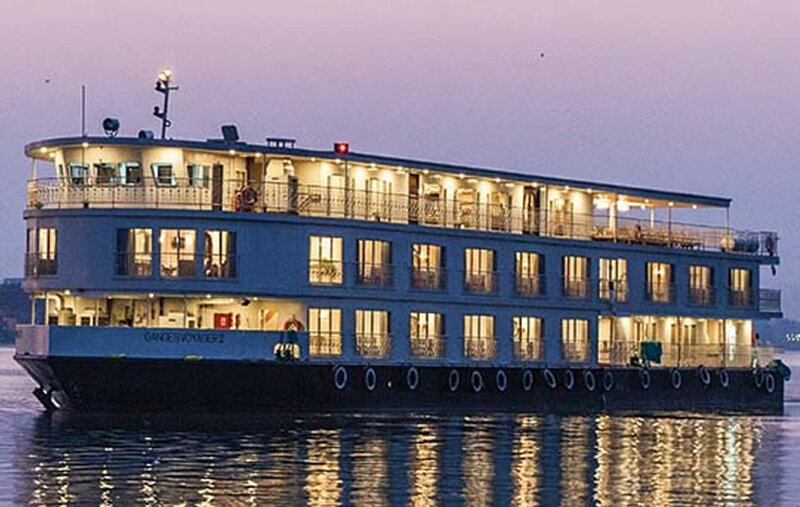 Your guided tour of India and Ganges River cruise begins in the bustling city of Delhi. You’ll tour the city with your expert local guide, and take a rickshaw ride through the Chandni Chowk bazaar - brimming with everything from silver and spices to saris of every colour. Welcome to India’s capital city! On arrival you will be transferred to your hotel. Hotel rooms are available for mid-afternoon check-in. Classic Excursion: Today’s guided sightseeing starts with an orientation to see the Red Fort, Jama Masjid, India Gate and the Presidential Palace. Afterward, take a rickshaw ride through Chandni Chowk, a captivating local bazaar—with its ancient alleyways lined with quaint shops that offer everything from silver and saris to spices and electronics. Classic Excursion: This morning, take a guided excursion to visit Qutub Minar, the world’s tallest brick minaret, which dates back to the 11th century. Next, visit Humayun’s Tomb and Gurudwara Bangla Sahib, Delhi’s largest and most prominent Sikh gurudwara (house of worship). 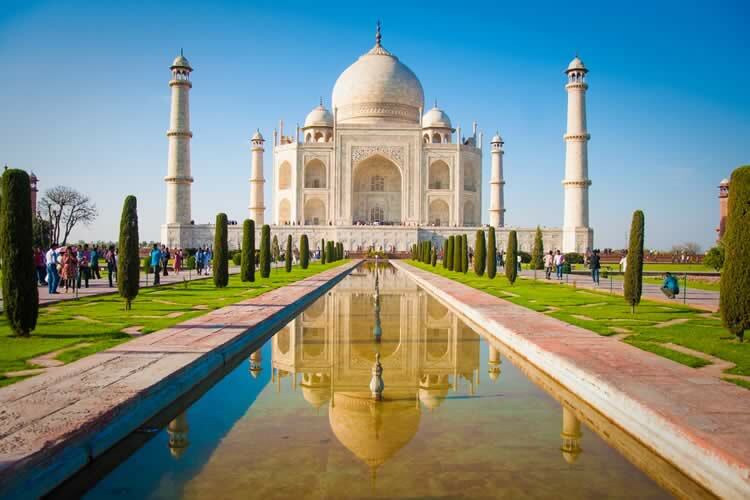 Classic Excursion: Start your day with a sunrise excursion to the incomparable Taj Mahal—Moghul Emperor Shah Jahan’s memorial to his beloved wife—more than 20 years in the making. Classic Excursion: Later, take a guided tour to Agra Fort, built by the Moghul Emperor Akbar. This formidable fortress of red sandstone conceals the imperial city of the Moghul rulers and its many palaces. Classic Excursion: This afternoon, take a guided tour of the City Palace and the adjoining museum, which houses a collection of rare manuscripts. Also, stop at Jantar Mantar and the famous Hawa Mahal (Palace of the Winds). The evening is at your leisure. Classic Excursion: Today, join a guided excursion to Jaipur’s spectacular Amber Fort, built entirely of white marble and red sandstone, and featuring intricate mosaics, carvings, paintings and mirror works. Spend the afternoon at leisure. Discovery Excursion: Tonight, enjoy a festive dinner with a cultural performance. Discovery Excursion: Ride on cycle rickshaws during your guided tour of Kalna. Along the way visit the historic terracotta temple complex and receive blessings from the temple priest. Also visit a muslin-weaver’s home. Discovery Excursion: Join a morning walk in the brass-making village of Matiari to see and interact with the craftsmen there. You’ll also see traditional sweets being made. Discovery Excursion: Enjoy a short guided walk through Azhimganj to see the local gold- and silversmithing workshops. You’ll also visit a local landlord’s mansion for authentic Indian tea, then travel by electric rickshaw in Jiaganj to see the art of Baluchari saree weaving. Classic Excursion: Join a morning walk through the pilgrim’s bazaar and visit the Iskcon temple, and meet and interact with a Krishna leader. You’ll also visit a goshala (rescue shelter for cows). Classic Excursion: This morning, take a guided walk through the colourful flower market. Afterward, stop to see Mother Teresa’s former home and the Calcutta Rescue. Classic Excursion: After lunch, join a guided visit to the Victoria Memorial Museum. Built to commemorate Queen Victoria, the museum houses a beautiful collection of paintings, textiles, weapons, and other artifacts from the Victorian era. Tonight, a farewell dance performance will be presented on the ship. Your holiday ends with breakfast this morning. Transfer to the airport for your overnight flight home. Return Flights from London, regional flights are available but may carry a supplement. All meals as stated in itinerary. Terms and conditions apply, all offers are subject to availability and operator booking conditions. All savings are included in the fares shown and were correct at time of print, but are subject to change. Prices are per person based on two passengers sharing the lead in grade stateroom unless otherwise stated. Savings of up to £1,850 per couple are valid on all 2019 cruises and must be booked by 28th February 2018. Free flights offer valid on all new Rhine cruise bookings made by 28th February 2019, departing the UK between 1 Jan 2019 and 30 Nov 2019 - only valid for bookings departing London Heathrow, London Gatwick, Manchester, Birmingham or Glasgow airports, on either British Airways, KLM or EasyJet operated flights, subject to availability. Alternative airlines/flight times are available at the time of booking for a supplement. Deposits of £99pp apply to all new Avalon European river cruises bookings made by 28th February 2019, departing the UK in 2019. Offer may be changed or withdrawn at any time. †VIP home pick-up service is available if you live within 100 miles of your departure point. If you live further than 100 miles, you can still take advantage of this service by paying £1.85 per extra mile. Mileage is calculated using the quickest route on Google Maps. This service is only applicable to the UK mainland. We charge a one-off small £20 booking fee. That’s it - nothing more and no add ons when you pay the balance. E&OE. ABTA P6710.